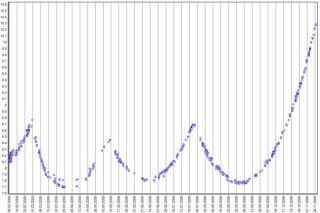 ISON measurements for suspected DSP F23 distributed over time and longitude (East), and drift from its orbital slot. Even in the vacuum of outer space, it's hard to keep the sound of a secret quiet. The U.S. Air Force apparently has a malfunctioning Defense Support Program (DSP) satellite on its hands. DSP-23 is one piece of a constellation of such Earth-staring satellites designed to detect missile launchings, nuclear detonations, and gather other technical intelligence. DSP-23 seems to be drifting out of its high-altitude slot -- and might prove troublesome to other high-value satellites in that populated area. One person that flagged the problem to a U.S. satellite tracking expert was a Russian space analyst -- a project partner of the The International Scientific Optical Network, or ISON for short. Vladimir Agapov is a senior scientist for the Keldysh Institute of Applied Mathematics of the Russian Academy of Sciences. He told SPACE.com that ISON is a global network of scientific optical facilities for observation of high altitude geocentric orbits. They keep an eye on what's going on in order to better understand the real population of artificial objects -- mainly space debris -- in that part of near-Earth space. Agapov said ISON is monitoring the whole GEO [Geostationary Earth Orbit] ring, with the network tracking all operational satellites, as well as space debris objects, spent rocket bodies, dead spacecraft, operational fragments, and objects originating from satellite fragmentations that have appeared in GEO region. "We have continuously tracked an object we have identified as DSP F23 since January 10, 2008," Agapov said. "Identification is made on the base of initial orbital information obtained by amateur astronomers using their own measurements," he said. Processing of optical measurements obtained by ISON confirmed that DSP-23, after making three station-keeping maneuvers, has not performed any follow-on movements, even tiny, during the course of some two months, he said. The spacecraft has strayed from its spot in space – moving along GEO as a passive object. Still, it's not clear from optical data alone just what the operational status of the satellite truly is at present, Agapov added. "You need other kind of observations, radio-monitoring data, photometry, etc., to come to more definitive conclusion." exists," Agapov said. Sauntering willy-nilly through space, the classified satellite could have close-encounters with many operational satellites, he said. As of the beginning of 2008 the ISON network consists of 18 scientific institutions in various nations, 18 observatories and observation facilities, 25 optical instruments, and more than 50 observers and researchers. In the big picture, Agapov noted that ISON has discovered 152 "unknown" objects that have no public orbital information as distributed by the U.S. Air Force Space Surveillance Network through its Space-Track database. In addition, ISON has discovered and established continuous tracking -- using a variety of instruments -- of 192 previously unknown faint GEO space debris objects. "Thus, our ISON effort resulted in increasing the number of known -- for the public -- and continuously tracked objects in GEO region by more than 35 percent, compared to published Space-Track data," Agapov concluded. Editor's Note: This version has been updated to include the correct name of the International Scientific Optical Network.